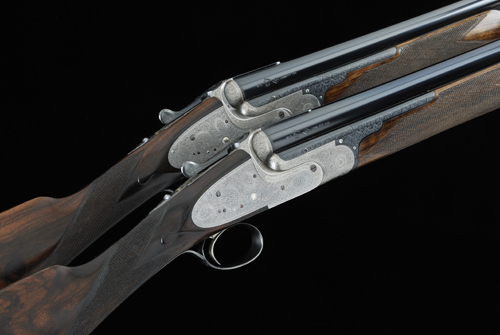 The guns, previously owned by Eric Clapton, feature 30-inch replacement barrels by the maker with 2.3/4-inch chambers about 1/2 and 3/4 choke borings, short ribs and extensions, the frames, locks and gold numbered top levers with fine bouquet and scroll engraving and retaining some original hardening colour, the maker’s name signed within a scrolling banner, gold lined cocking indicators, rolled edge trigger guards, 14.1/2-inch well figured stocks with straight hands and recoil pads, 6lb. 13oz., nitro proof, in their maker’s lightweight leather case. The maker confirms that the guns were built in 1912 and the replacement barrels (numbered 10243/4) were fitted by themselves in 2005. The guns have been maintained by the maker in recent years with no expense spared.